Read any good cookbooks lately? Summer reading doesn’t have to be limited to spy fiction, mystery novels and celebrity bios. Some of the best cookbooks—aside from being filled with practical recipes—are perfect for reading on their own, at the beach or on the porch. 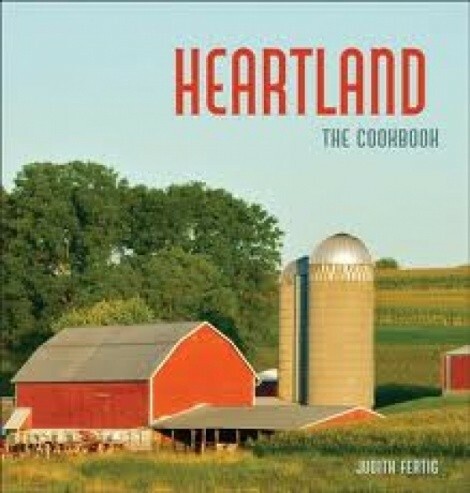 Judith Fertig’s Heartland: The Cookbook is one such book. It’s a beautifully photographed cookbook that could double as a coffee-table book, paying tribute to America’s Midwestern farmers and the burgeoning farm-to-table movement in this country. It’s bursting at the seams with stories and recipes about and from farmers, many with Amish, Scandinavian, Czech, Swedish, German and Italian backgrounds. Recipes for dishes such as caramelized cabbage rolls and dried-cherry scones are juxtaposed with interesting asides about cattle breeds of American-heartland beef, making sweet sorghum, and even the origins of the all-American potato chip. There are plenty of reasons these days to be embarrassed by America; Fertig’s heartfelt embrace of the heartland is a welcome reminder that much of this country’s greatness was built by hardworking, honest Midwesterners. This book’s a keeper. And, so is For Cod and Country by Washington, D.C., chef Barton Seaver. This is an excellent new book about sustainable cooking featuring seafood. Beginning with the John Hersey quote “In our quest for food we begin to find our place within the systems of the world,” For Cod and Country teaches us how “to eat our way back to healthy oceans” by offering clear-cut, simple guidance on how to find, buy and cook sustainable seafood. And, it’s packed with recipes for what to do with your fish and seafood once you’ve acquired it. There’s also a terrifically practical A-Z (well, almost) section about each sustainable fish—from Amberjack to Wahoo—as well as a useful chart of seafood substitutions for over-fished species like Atlantic cod, shark and skate. This is, quite simply, the best seafood cookbook I’ve yet to encounter. What would summer be without the usual spate of books about grilling and barbecue? Well, one worthy of your attention is Fire It Up by Andrew Schloss and David Joachim, with more than 400 recipes for grilling everything from beef cheeks and beets to chickpea chapatti and grilled (yes, grilled) pear soup. I cooked up the “Ultimate Cheeseburger” from the book, and it was killer. It had never occurred to me to incorporate the cheese into the beef rather than just putting it on top. The difference is astounding: cheesy goodness through and through. An extensive section on dry and wet rubs, mops, brines, marinades and sauces alone makes this fine grilling handbook worthwhile. I am typically surrounded by people when I eat. And so, now and then, I really cherish a meal alone. For advice on eating solo, it’s hard to beat Serve Yourself: Nightly Adventures in Cooking for One by the James Beard award-winning food editor of the Washington Post, Joe Yonan. Unfortunately, cooking for one isn’t as simple as merely dividing full-size recipes by four, six or eight—and Yonan knows that. “You don’t have to resort to takeout just because you live alone,” he says. Yonan then goes on to show us all how to make easy, globally inspired dishes tailored for one person. Highlights include Cornish game hen (perfect for singles) with cherry-hazelnut-wine sauce, Yucatan-style slow-roasted pork, “puffy” egg frittata with smoked salmon and even a Texas Bowl o’ Red for one. Serve Yourself features more than 100 recipes, but you might not make it past the chapters on tacos and pizzas, so chock-full are they of delicious single-serving temptations. Thanks to Mario Batali, Lidia Bastianich, Giada de Laurentiis, Michael Chiarello, Rocco DiSpirito, et al., do we really need another Italian cookbook? Well, yes, if it’s Domenica Marchetti’s The Glorious Pasta of Italy. Carb-haters can skip to the next paragraph because this book is an homage to all things pasta. Gorgeous photos accompany recipes for dishes like summer ravioli with arugula pesto, timballo di maccheroni alla chitarra, pot roast pappardelle and my favorite, BLT bucatini, which is a heavenly dish of thick bucatini pasta tossed with slow-roasted cherry tomatoes, pancetta, olive oil and arugula. In addition to those type of recipes, there’s also invaluable advice on making pasta from scratch and cooking and storing it and how to cut various shapes—tagliatelle, maltagliati, pappardelle, fettuccine, maccheroni, lasagna, etc.—by hand or by machine. There are mountains of books about Italian cooking cluttering the bookstore shelves; this one is worth bringing home. But of course, eating isn’t all we do. We also drink. And, for those like me who love the well-turned phrase about imbibing, look no farther than Everyday Drinking, a rollicking compendium of Kingsley Amis’ wit and wisdom on the topic of drink. With an introduction by Christopher Hitchens that itself is worth the price of the book, Everyday Drinking includes enjoyable essays on subjects such as “The Hangover,” “Alcohol and Your Interior,” “First Thoughts on Wine” and even “How Not to Get Drunk.” “If you can’t annoy somebody, there’s little point in writing,” Amis once said, and Everyday Drinking is bound to annoy wine and booze snobs of all stripes. To wit, an Amis zinger like this one: “Never despise a drink because it is easy to make and/or uses commercial mixes. Unquestioning devotion to authenticity is, in any department of life, a mark of the naive—or worse.” Booklist said it best: “Amis’ quips and gripes about noisy pubs, vodka drinkers, wine snobs, teetotalers and hangovers grow more delicious with age.” Just like fine wine.